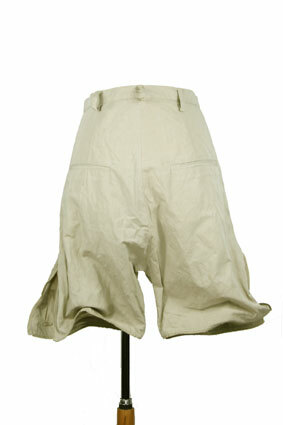 Barbara Bologna stone coloured shorts, washed and crinkled, 'Metal Shorts'. Belt loops. Zip fly with placket. Round leather button in black attached by black lace at waist. 2 side pockets and 2 rear pockets. At each side there is a 8 inch slit at the hem, the hems are wired and the wire extends up along the slits, allowing the short leg to be shaped dramatically, very cool. Very special garment and as close as you can get to couture off the peg. Matches the jacket in the same fabric.